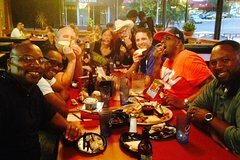 Voted KC's #1 Food Tour by Kansas City residents, KC Barbecue Tours is the only company to offer Kansas City locals and visitors the opportunity to sample the world’s best barbecue. This bus-guided food tour will make your taste buds dance as our guides take you into a variety of Kansas City’s big name barbecue establishments and hidden barbecue gems. You will also get to travel through some of Kansas City’s most historic neighborhoods. Voted KC's #1 Food Tour by Kansas City residents, KC Barbecue Tours is the only company to offer Kansas City locals and visitors the opportunity to sample the world's best barbecue. This bus-guided food tour will make your taste buds dance as our guides take you into a variety of Kansas City’s big name barbecue establishments and hidden barbecue gems. You will also get to travel through some of Kansas City’s most historic neighborhoods. On our 4-hour food tour we will visit 4 different barbecue restaurants. From brisket to burnt ends, every guest will enjoy a portion of each restaurants best smoked meats and side dishes. Not only will every guest have the opportunity to taste some of the world's best barbecue, but they will also be given a behind-the-scenes look at how barbecue is prepped, smoked and served. • All tastings - Each restaurant will offer at least one meat and side dish to every guest. • Transportation - We will provide transportation from restaurant to restaurant. • Gratuities - We will be responsible for all restaurant gratuities. • What's not included in the price? • Beverages other than water. All guests are welcome to purchase anything you prefer to drink other than water. • Tour guide tips - we work to the bones so you can enjoy the meat on the bones. A tip is always appreciated. Tours fill up fast! Don't delay, register today and bring your carnivorous appetite for the entire way.